Small and cute like my wife. A little cantankerous too. The lantern I mean. Can you get stickers for these ? Saul--That's a Thermos, and not a Coleman at all. It's very nice, but nothing made by Coleman. Made by Coleman for Sears. Ya I knew it was not a Coleman make. Ive got a Thermos like that to. Looses pressure fast, I gotta look into that. Saul--No meanness meant. Just saying, that's a cool lantern and absolutely the kind of thing I like. Just a different make. Zach--Search around here some. 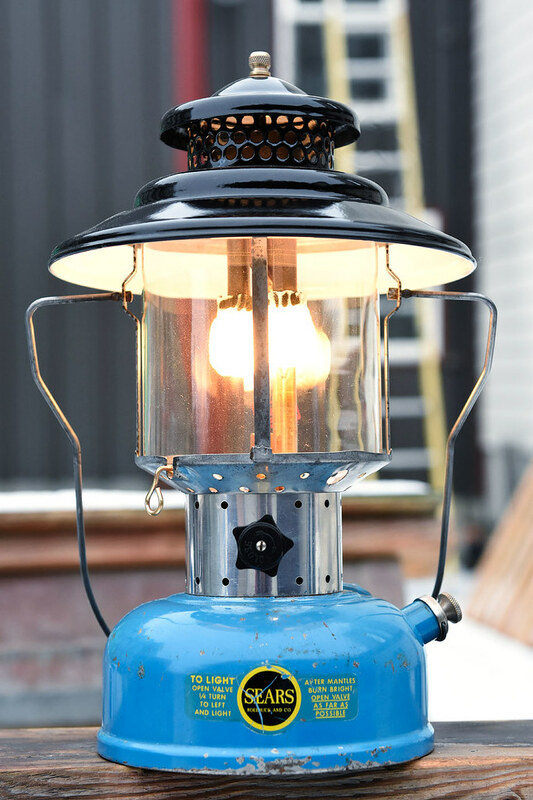 The Thermos lanterns have several o-rings in the pump system, one of which is very difficult to replace. Loosing pressure rapidly means fount air--saturated with fuel--is leaking, which isn't all that safe. Don't use that Thermos in the HOUSE! Ya it stunk up my office pretty bad, it runs rich and flames a lot until it is hot. Would not bring it in the house. Does seem to hold pressure ok. Pump might need some more lubricant. Still not bad for two dollars at a yard sale. It's been a long time since I have found anything good as far as lanterns go. I am not sure about the instruction decal but OCP has the thermos decal. Fred has the front decal too, but not the instructional decal. The "Don't use in the house" comment was not referring to the smell. These have pump/check valves that are prone to failure and spewing gas. There is not a positive shutoff on the check valve. I'd go one step further and state not to use it close to the house without a fire extinguisher handy, just in case. I've since removed the pump from one and installed a Schrader valve, eliminating the fear factor. You may want to review these threads. The first has info on replacing the O-rings.